Often times we need to execute certain tasks repeatedly. In this blog post, we will talk about building a simple task scheduler in Windows Azure. We’ll actually develop a simple task scheduler which will run in a Windows Azure Worker Role. We’ll also discuss some other alternatives available to us within Windows Azure. For the purpose of demonstration, we’ll try and build a simple service which pings some public websites (e.g. www.microsoft.com etc.) and stores the result in Windows Azure Table Storage. This is very similar to service offered by Pingdom. For the sake of argument, let’s call this service as “Poor Man’s Pingdom” . We’ll store the sites which we need to ping in a table in Windows Azure Table Storage and every minute we’ll fetch this list from there, ping them and then store the result back in Windows Azure Table Storage (in another table of course). We’ll run this service in 2 X-Small instances of worker role just to show how we can handle concurrency issues so that each instance processing unique set of websites. We’ll assume that in all we’re pinging 10 websites and each worker role instance will ping 5 websites every minute so that the load is evenly distributed across multiple instances. At the core of the task scheduler is implementing the scheduling engine. There’re so many options available to you. You could use .Net Framework’s built in Timer objects or you could use 3rd part libraries available. In my opinion, one should not try and build this on their own and use what’s available out there. For the purpose of this project, we’re going to use Quartz Scheduler Engine (http://quartznet.sourceforge.net/). It’s extremely robust, used by very many people and lastly it’s open source. In my experience, I found it extremely flexible and easy to use. We want to ensure that only one instance fetches the master data i.e. the data required by scheduler to process. For this we would rely on blob leasing functionality. A lease is an exclusive lock on a blob to prevent that blob from modification. In our application, each instance will try and acquire lease on the blob and only one instance will be successful. The instance which will be able to acquire the lease on the blob (let’s call it “Master Instance”) will fetch the master data. All other instances (let’s call them “Slave Instances”) will just wait till the time master instance is done with that data. Please note that the master instance will not actually execute the task just yet i.e. in our case ping the sites. It will just read the data from the source and push it some place from where both master and slave instances will pick the data and process that data (i.e. in our case ping the sites). It’s important that we make full use of all the instances in which our application is running (in our case 2). So what will happen is that the master instance will fetch the data from the source and puts that in a queue which is polled by all instances. For the sake of simplicity, the message will simply the URL that we need to ping. Since we know that that there’re two instances and we need to process ten websites, each instance will “GET” 5 messages. Each instance will then read the message contents (which is a URL) and then ping those URLs and record the result. In normal worker role implementations, the worker role is in an endless loop mostly sleeping. It wakes up from the sleep, does some processing and goes back to sleep. Since we’re relying on Quartz for scheduling, we’ll only rely on Quartz for triggering the tasks instead of worker role. That would give us the flexibility of introducing more kinds of scheduled tasks without worrying about implementing them in our worker role. To explain, let’s assume that we’ve to process 2 scheduled tasks – one executed every minute and other executed every hour. If we were to implement it in the worker role sleep logic, it would become somewhat complicated. When you start adding more and more scheduled tasks, the level of complexity increases considerably. With Quartz, it’s really simple. For the purpose of this blog post, to keep things simple, we will not worry about handling various error conditions. We’ll just assume that everything’s hunky-dory and we’ll not have to worry about transient errors from storage. In an actual application, one would need to take those things into consideration as well. Each instance will try and acquire the lease on a specific blob. As we know, only one instance will succeed. We’ll assume that the master instance would need about 15 seconds to read the data from the source and put that in queue. The slave instances will wait for 15 seconds while master instance does this bit. 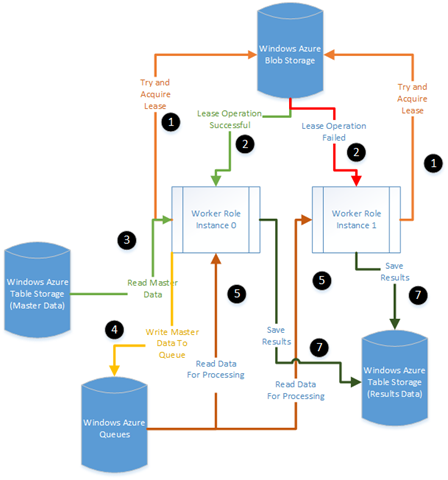 Master instance will fetch the data from master data source (Windows Azure Table Storage in our case). Slave instances are still waiting. Master instance will push the data in a queue. Slave instances are still waiting. All instances will now “GET” messages from the queue. By implementing “GET” semantics (instead of “PEEK”), we’re making sure that a message is fetched only by a single instance. Once the message is fetched, it will be immediately deleted. Each worker role instance will get the URI to be pinged from the message content and launches a process of pinging the data. Pinging will be done by creating a “Get” web request for that URI and reading the response. Once the ping result is returned, we’ll store the results in table storage and then wait for the next time Quartz will trigger the task. Enough talking! Let’s look at some code . Since we’re storing the master data as well as results in Windows Azure Table Storage, let’s create two classes which will hold that data. Both of these will be derived from TableEntity class. /// Gets or sets the URL to be pinged. This entity will store the result of the ping. /// Gets or sets the URL pinged. /// Gets or sets the HTTP Status code. /// Gets or sets the time taken to process the ping in milliseconds. Ensuring that the table in which will store the results is already present. Ensuring that the blob on which we’ll acquire the lease is already present. // Get the cloud storage account. // Create the blob container. // Write some dummy data in the blob. // Get the table name for storing results. // Get the queue name where ping items will be stored. // Call the initialization routine. Now if we run this thing, we will see the following in our storage account. Now let’s create a job and schedule it. To start with, the job won’t be doing any work. We’ll just create a class called PingJob and have it implement IInterruptableJob interface in Quartz library. We’ll just call this function in our role’s Run() method as shown below and our job is now scheduled. It will fire off every minute. It’s that simple! // Call the job scheduling routine. Now all we’re left to do is implement the job functionality. So let’s do that. As mentioned above, first thing we want to do is try an acquire lease on the blob. We’ll keep things simple and if there’s any exception we would just assume that another instance acquired lease on the blob. In real world scenario, you would need to take proper exceptions into consideration. // Try and acquire the lease. // If successful then read the data. // Else just sleep for 15 seconds. Next step would be reading master data. Again keeping things simple, we’ll not worry about the exceptions. We’ll just ensure that the data is there in our “PingItems” table. For this blog post, I just entered the data in this table manually. Now we’ll save the data in process queue. Next we’ll fetch data from process queue and process those records. Each instance will fetch 5 messages from the queue. Again for the sake of simplicity, once a message is fetched we’ll delete it immediately. In real world scenario, one would need to hold on to this message till the time the message is processed properly. This is the final stage of our task. We’ll write a function which will fetch the URL and returns a PingResult object which we’ll persist in table storage. req.Timeout = 30 * 1000;//Let's timeout the request in 30 seconds. // Introduce a random delay between 100 and 200 ms to to avoid race condition. //Now save this data as messages in process queue. Here’s the complete code for pinging job in one place . Recently Windows Azure announced the availability of a job scheduler functionality in Windows Azure Mobile Service. You can write code using node.js for job functionality and mobile service takes care of job execution. For more information, please visit: http://www.windowsazure.com/en-us/develop/mobile/tutorials/schedule-backend-tasks/. Aditi (www.aditi.com), a big Microsoft partner recently announced the availability of “Scheduler” service which allows you execute any CRON job in the cloud. This service is also available through Windows Azure Marketplace and can be added as a add-on feature to your subscription. For more information, please visit: http://www.aditicloud.com/. As demonstrated above, it is quite simple to build a task scheduler in Windows Azure. Obviously I took a rather simple example and made certain assumptions. When you would build a service like this for production use, you would need to address a number of concerns so that you build a robust service. I hope you’ve found this blog post useful. Do share your thoughts by providing comments. If you find any issues, please let me know and I’ll fix them ASAP.